We learn something new every day. Hands up those who even knew that it wasn't just pre-pubescent teenagers or oily skinned youths or even over-indulgent chocoholics who suffer from acne, bane of our lives! Well read on - the following article has been supplied by PurrForm and can be found on their website. Acne, in cats, is a common dermatological condition. Chin acne is a disorder resulting from follicular keratinization. Keratinization is the over-production of keratin, a protein found in the outer layer of the skin. If this excess keratin becomes trapped in the hair follicles, comedones or “blackheads” form. In turn, if these comedones become infected with bacteria, “pimples” may form. 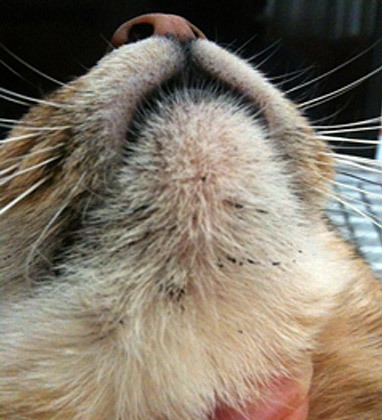 Therefore, feline chin acne is similar to the acne experienced by humans. A primary disease which causes excessive sebum production (the natural oily “moisturizer” produced by the skin) ie. Hyperactive sebaceous glands. Skin allergies, which can be caused as a result of cats rubbing their chins on people or things which leads to irritation or inflammation (contact dermatitis). Underlying systemic condition like a viral or fungal infection. A compromised immune system, and stress. In a significant number of cats, there is, quite surprisingly, an association between using coloured plastic food dishes and chin acne. In this situation, if the food dishes are changed to ceramic, glass, or stainless steel, the condition may resolve without any treatment, as the problem can be due to a plastic or dye allergy. Diet can also often be a contributing factor. Therefore, it is important to evaluate your cat’s diet. Food allergies are often the cause and it is commonly found that by removing unnecessary grains and carbohydrates from the diet, as well as giving cats a break from both seafood and poultry as protein sources, can make a huge difference in preventing a recurrence of feline acne. Cats only require a very small amount of carbohydrates in their diet and their guts do not possess the ability to break down grains and vegetable matter. Likewise, many cats do develop allergies to fish and poultry, as these are so commonly found as a base, in many processed and dry foods. Regardless of the cause, the result is that the hair follicle becomes blocked and therefore causes an infection which results in the clinical signs described. The most common clinical signs associated with chin acne are the “dirty” appearance of the chin and lesions which may appear on the chin, the lower lip and/or the upper lip. Careful observation will reveal the “blackheads” and infected follicles. In severe cases, there may be hard, crusty lesions that are sore when touched. 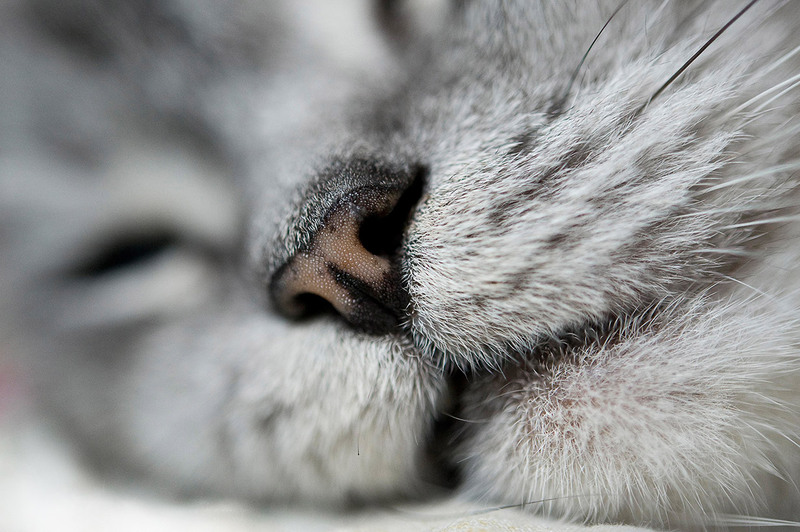 Both male and female cats can develop chin acne. Diagnosis is based on clinical signs and medical history. Occasionally, blood and urine tests and skin culture and sensitivity tests are required. If the lesions do not have a typical appearance, biopsies or skin scrapings may be recommended to rule out more severe conditions. Your vet will be able to recommend the best course of treatment, which may involve facial treatments or special shampoos to cleanse the affected area and hair follicles. In some cases, the hair may need to be clipped short. More severe / chronic cases may require a different approach. 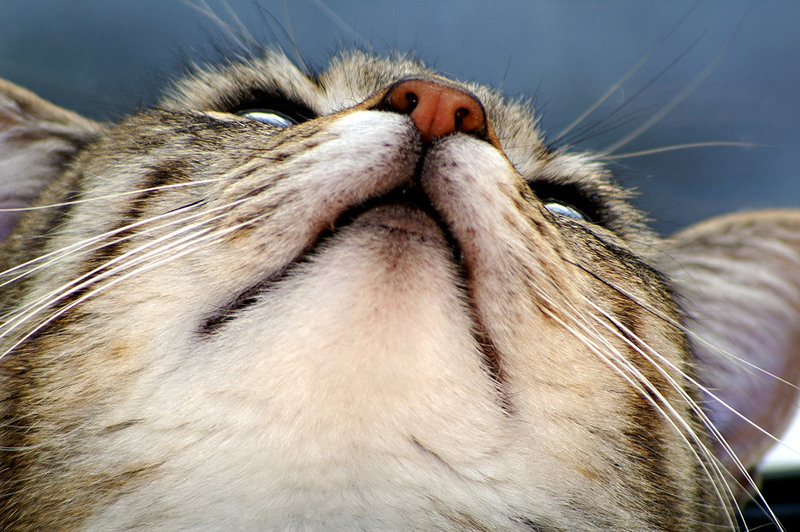 Some cats only develop chin acne once in their lives, whereas, in some cats, it will be a recurring problem. It is important to identify the cause, to avoid recurrence and so that the correct treatment can be carried out. Most cases improve with better hygiene or to a simple change in either food or food dishes, as allergies can be a contributing factor. More severe cases may require aggressive treatment to control the problem. However, as with so many feline conditions, an inappropriate diet can so often be to blame. Switching to a species appropriate, highly digestible, high protein diet, is sometimes all it requires for your cat to return to good health. As in all situations, all cat owners should remember to closely follow instructions given by their veterinarian. I do not even know the way I stopped up right here, but I believed this publish was once great. I don’t recognise who you are however certainly you are going to a well-known blogger if you happen to are not already. Cheers! Hey would you mind stating which blog platform you’re working with? I’m planning to start my own blog in the near future but I’m having a tough time deciding between BlogEngine/Wordpress/B2evolution and Drupal. The reason I ask is because your design seems different then most blogs and I’m looking for something unique. P.S My apologies for getting off-topic but I had to ask! What’s up colleagues, pleasant piece of writing and nice urging commented here, I am in fact enjoying by these. Hi there everyone, it’s my first visit at this site, and paragraph is genuinely fruitful in support of me, keep up posting these types of articles or reviews. Excellent site you have got here.. It’s hard to find high quality writing like yours nowadays. I truly appreciate individuals like you! Take care!! I’ve been surfing on-line greater than 3 hours lately, yet I by no means discovered any interesting article like yours. It is pretty worth enough for me. In my view, if all site owners and bloggers made excellent content as you probably did, the internet will be much more helpful than ever before. It is not my first time to pay a quick visit this web site, i am visiting this website dailly and obtain pleasant data from here all the time. This is the perfect webpage for everyone who hopes to find out about this topic. You know so much its almost tough to argue with you (not that I actually would want to…HaHa). You certainly put a new spin on a subject which has been written about for ages. Great stuff, just wonderful! Hi there! I could have sworn I’ve been to this website before but after checking through some of the post I realized it’s new to me. Anyhow, I’m definitely delighted I found it and I’ll be book-marking and checking back often! My relatives every time say that I am wasting my time here at web, except I know I am getting know-how all the time by reading such nice posts. Hi, yes we are @mutznutzmogz, thank you.